This chapter explores the kinesthetic qualities of Islamic calligraphy in visual time-based media. The chapter explains that Islamic calligraphy in various forms and styles invokes a feeling of dynamism and a kinesthetic sense. The different elements responsible for this dynamic sense in traditional calligraphy and in neo-calligraphy are then studied. It is argued that owing to its qualities, the calligraphic line of Islamic calligraphy is imbued with kinesthetic energy along its trajectory. Visual time-based media and especially animation are, it is argued, ideal media for an exploration of these kinesthetic energies of Islamic calligraphy. 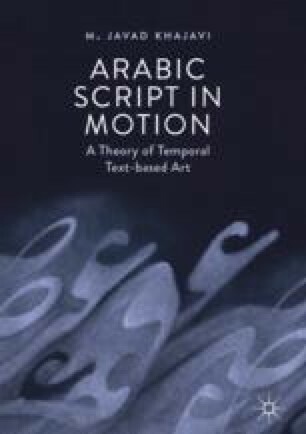 Informed by these kinesthetic qualities, this chapter introduces a broad category of temporal events called kinesthetic behaviors and explores different types of temporal behaviors that calligraphic forms may exhibit in this category. The chapter concludes by reviewing how kinesthetic behaviors influence legibility and readability of temporal text.